Coarse-grained layers inside Mars’ Gusev Crater. Image credit: NASA/JPL/Cornell. Click to enlarge NASA engineers have moved the Spirit Mars rover to a safe North-facing slope to ride out the Martian winter. Since the rover is in the Southern hemisphere, it gets much less sunlight during the Winter. 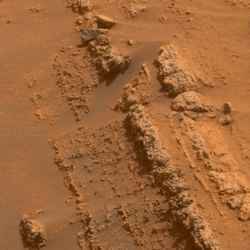 This maneuver was made more difficult because its … Continue reading "Mars Rovers Head for New Sites After Studying Layers"